Prime Minister Narendra Modi will seek to allay Bangladesh’s concern over possible adverse fallout on Assam’s National Register of Citizens (NRC) updating exercise when he meets his counterpart Sheikh Hasina later this month. The two Prime Ministers are scheduled to meet on the sidelines of the BIMSTEC summit at Kathmandu beginning August 30. The two leaders have already met thrice this year , the last time during the inauguration of the Bangladesh Bhavan at Shantiniketan in West Bengal. This meeting is very important because this would possibly be the last between the two leaders before the Bangladesh Parliament elections scheduled later this year. Despite assurances by Indian High Commissioner H V Shringla and Union Minister of State for Home Kiren Rijiju that the NRC updating is an internal matter of India and will not affect Bangladesh , the present dispensation in Dhaka is worried over the shrill anti-Bangladesh rhetoric by BJP leaders and the impact it might have on the poll campaign in Bangladesh. 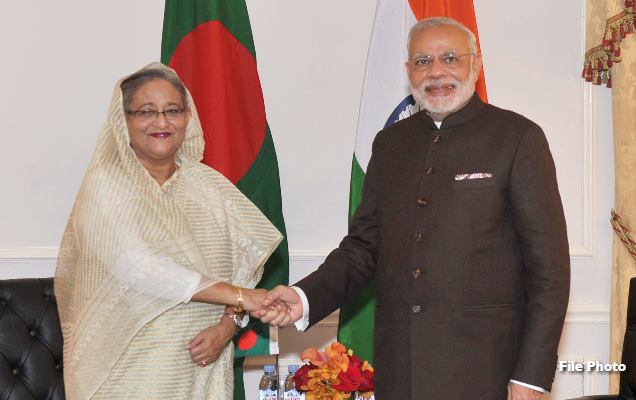 The threat of throwing out illegal infiltrators from Bangladesh may be used by anti-Indian Islamist parties who project Hasina’s Awami League as an Indian stooge who has given away much to India without getting any tangible benefit for Bangladesh in return. Dhaka has been assured that the NRC document released on July 3o was only a draft and those left out still had the chance to get included during the claims and objections process now underway. Top sources at the Centre told Northeat Now that Prime Minister Modi will use the Kathmandu meeting to personally allay Hasina’s fears over the NRC fallout and detail some more Indian aided projects in Bangladesh. This may have to some extent been triggered by West Bengal Chief Minister Mamata Banerjee ‘s allegations that the NRC exercise will ruin India’s relations with Bangladesh . But BJP leaders point to Banerjee’s strident pitch against the Teesta water sharing accord with Bangladesh as more damaging to India-Bangladesh relations than any other single issue. Senior BJP leaders like Tripura Governor Tathagata Ray have said that getting a fair share of the waters of Teesta was due to a lower riparian nation like Bangladesh as a matter of right.